Take an iconic orchestra, a famous venue, and a world-class conductor, then put them all together and what do you get? Probably not tickets (actually, you can get tickets with a bit of luck). No, it’s Waltz time with a capital W at the legendary New Year’s Concert in Vienna. The turn of the year sees the Musikverein concert hall decked out in huge floral arrangements and hosting a three-day residency by the “house band”, which just happens to be the Wiener Philharmoniker (Vienna Philharmonic Orchestra). The “main event” is the New Year’s Concert on the morning of January 1st, but the orchestra performs the same programme on the two days before, giving more people the chance to enjoy this rather wonderful 2 1/2-hour celebration of music. This feast of music, with its concurrent message of peace and harmony, has rather ignominious roots. The first New Year’s Concert was held in Vienna in 1939, with the proceeds going to the Nazi’s annual charity drive. How times change. Initially, it was the Philharmoniker’s own concert master who waved the conductor’s baton at the event but, since 1980, the honour of conducting the orchestra has changed each year. Some of the most famous names in classical music have welcomed in the New Year in Vienna, including Herbert von Karajan, Claudio Abbado, Riccardo Muti, and Zubin Mehta. In 2019, Christian Thielemann conducted the New Year’s Concert for the first time. He’d worked with the Wiener Philharmoniker before, appearing with them at the Musikverein on many occasions. The 2020 conductor is Andris Nelsons, another first timer. The Latvian conductor is music director of the prestigious Boston Symphony Orchestra and the Gewandhauskapellmeister of the Leipzig Gewandhaus Orchestra. Like those before him, Nelsons is no stranger to Vienna or the Philharmoniker. In April, for example, he will conduct the orchestra at venues in Vienna, Hamburg and Hannover. Since 2020 is Beethoven year, rumour has it that the Bonn-born composer’s works will likely feature strongly in the pieces performed in the concert. Vienna has a tradition of egalitarian access to culture. So, for example, you can see opera at the State Opera House for as little as the price of a cup of coffee. Tickets for the New Year concert performances start at around €20, though you can pay much more for the better seats, of course. The problem is how to get one. The good news is you have as good a chance of getting a ticket as just about anyone. The bad news is that this chance is not very high. A simple lottery decides who can buy tickets, which you can enter online at the Wiener Philharmoniker website. To do so, you must register at the site in February. Full details here. If you miss out on tickets, you can always switch on the television. Austria’s state broadcaster (ORF) typically shows the event live on their ORF 2 channel or you can listen in on the radio (the ORF’s Ö1 station). You don’t even have to be in Austria to enjoy it. In 2019, for example, the New Year’s Concert was transmitted live to over 90 countries across the globe. 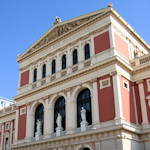 For directions, should you be lucky enough to get tickets, see the main Musikverein article.